Online directories are getting increasingly popular among individuals and businesses alike. Directories offer organized listings that are tailored to the user’s needs. Information is organized according to industry type. 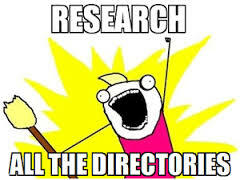 There are several directory building platforms that can help you in creating online directories with powerful features. Microsoft Azure is a cloud computing platform that allows you to deploy ActiveDirectory, manage SQL databases and run SharePoint. It offers powerful capabilities for managing groups and users. It also simplifies basic user access to any cloud app. By enabling single sign-on, users can access thousands of cloud applications on Windows, Mac and iOS platforms. It also allows users to launch cloud applications from a web-based Access Panel. Azure is effective in protecting sensitive data and applications with its Multi-Factory Authentication services. It prevents unauthorized access to both cloud and on-premise applications alike. It mitigates potential threats by identifying inconsistent access patterns through security monitoring and alerts. You can integrate on-premise directories with Azure ActiveDirectory to enable single sign on to every cloud-based application. Basic user attributes from the on-premise directories are automatically synced to the cloud. DirectoryPress is a WordPress theme that is popularly used for building link and article directories on WordPress. It offers plenty of custom tools. Almost every element of the theme is customizable. It offers up to 25 different payment gateways. Colors and columns are easily editable. It also offers a custom field editor that enables you to create new custom fields. It lets you create taxonomies, such as tags and categories to enhance performance of listings. User-generated content is important for any online directories. It can be very difficult, if not altogether impossible, to input the entire data on your own. DirectoryPress empowers users to create and manage their listings. User purchase history is also displayed in their account. Another useful feature is the messaging tool that lets users communicate with one another. The overview screen gives complete summary of entire website services, including summary of sales performance, least viewed and most viewed listings and total number of active listings. When new listings are created with unique links, the theme lets you take a screenshot of the page and display it as thumbnail on the website. 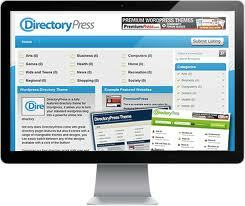 DirectoryPress offers advanced features for creating powerful directories. It simplifies the consolidation of information from the Web into the site. The information is also easy to search. The theme lacks a blog. It changes the regular “post” post-type to “Listings” post-type, taking away the user’s ability to blog. Also, some of the designs lack finesse. Perfecting DirectoryPress may require some time especially for users new to WordPress. However, seasoned WordPress users shouldn’t find it very difficult to grasp all the features and settings. It offers a professional support forum and shares links to useful resources. It also responds to email inquiries from users who need help. eDirectory encourages users to create online directories with a focus on maximizing ad revenue. It offers a PHP software platform for building online directories with ease. It offers powerful features, such as integrated CMS, advanced reporting, Payment Process and SEO Center. It also allows users to create mobile apps from within the admin area. The feature is easy to use and does not require advanced code knowledge. The only requirement is to choose the data and elements that are required and add an icon for the app. The SEO Center comes with the installation and is a useful feature that allows website owners to get their website ranked well on the search engines for relevant search queries. It also supports multiple directories and makes it easier to manage all the sites from a single interface. It comes with 4 professionally designed themes. Advanced developers have the option to use eDirectory’s built in code editor to tweak HTML and CSS. eDirectory offers responsive solutions that deliver seamless experience for desktop and mobile users alike. It also has a dedicated support center with access to useful resources. Email inquiries are also entertained and answered by the platform developers. Online directories will continue to be in demand. Small businesses are always exploring cost-effective ways of promoting their offerings, and being listed on directories offers many benefits to them from the marketing standpoint. To maximize your chances of success, build your directory around a business niche or industry that you’re passionate about. ← What Makes A Successful and Useful Directory in 2014? Which platform is suitable for my project? Every platform has its own features. You must start by identifying your needs clearly. After understanding the kind of website you need, you can look for the platform that is most suitable for building the directory type. How to Capitalize from Directories? Most website owners earn passive income through ad revenue. When your directories start ranking well on the search engines, you can sign up with an ad network to earn passive income. Some sites require a business to pay for being listed. That is another method of generating income from directory sites. How to Sell the Listings? There are several methods you can use to sell the listings. This includes telemarketing, classified ads, door to door and flyers.